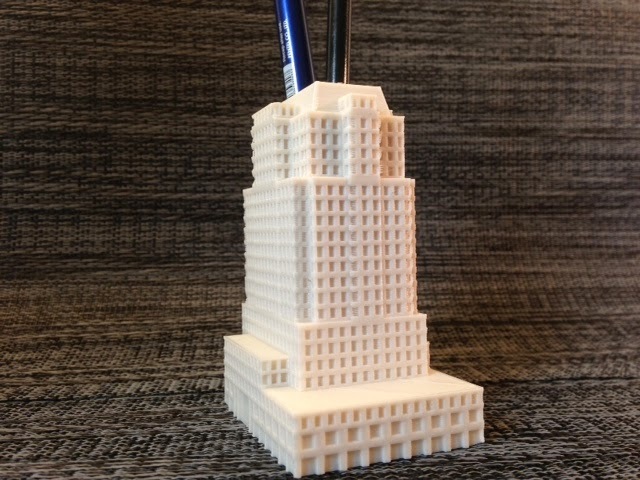 This is a model of the building that houses the MakerBot Headquarters in Brooklyn, with a hole in it for a couple of pens or whatnot. The basic building shape was downloaded from Trimble 3D Warehouse, then resized and converted to STL in Sketchup, with windows added in Tinkercad. Settings: MakerWare .3mm/low in 3-4 hours. Technical notes, short version: Get the model from Trimble, open and resize in Sketchup, clean up and add features in Sketchup or Tinkercad, and download the .stl for printing. Download a Sketchup (.skp) model of a building from Google's Trimble 3D Warehouse. Open the model in Sketchup. In order to look around with your mouse you'll have to first press "Orbit" or "Pan" from the button menu. The building in this example had a flat ground-level piece attached to it. If this is true of your model then use the "Select" arrow to highlight that piece and delete it. Sketchup is for buildings so the scale is HUGE in there. You'll have to shrink down the model a lot. One easy way to do this is to use the "Tape Measure" button, clicking first at one corner of the front of the building, then at the other. At the bottom of the window is a text box where you can enter the new length for the line segment you just selected with the tape measure. In the example model this length started as 214' 10 1/2" and I shrunk it down to 10'. Now, I know that doesn't make sense because I can't print a 10-foot model, but shrinking it down to inches made it too small in Tinkercad for some reason. Fiddle around and see what works for you in the next steps. Your model will now look really really tiny in Sketchup! You'll have to zoom in a lot if you want to find it, by using the scroll button on your mouse and pointing at the center of your desired zoom area. Hopefully your model is still near the origin. At this point you could modify your model in Sketchup but I think Tinkercad is easier so I'm going to do the rest over there. Sketchup doesn't automatically know how to do export to STL, so you will have to install this free STL export plugin from Sketchup. If you have install problems then scroll through the comments on that site, where most problems you might encounter are discussed and solved. Once you have the plugin set up you should have an "Export STL" option under the "File" menu in Sketchup. Export your file. Open this new .stl file in Tinkercad by using the "Import" tab at the top of the right menu column. Use inches as your unit of measurement, or at least give that a try and if it doesn't work then use millimeters. If your model is still too large or small you can change what you did in Step 4 with Sketchup, or you can just resize in Tinkercad. I have this weird feeling that extreme resizing in Tinkercad can cause problems, so if the size is way off then I would suggest going back to Sketchup to fix it. Clean up your model in Tinkercad by using rectangular shapes to fill in or hole off things that you don't want. The model may be aligned one or two degrees away from the axes, which in particular could make it not sit flat on the Workplane. Use a rectangular hole to shave off the bottom of the building and make it flat, and then move the model back down to the Workplane. If you want to add a hole to the building to make it a pen-holder or whatever then add a hole. I would advise doing that only after you have resized the building to the size that you will be printing at, so that you can control the size of the border around the hole accurately. Add windows or other features using small holes. It will go fairly quickly if you are good with the Align, Copy/Paste, Workplane, and Control-D tools. You don't want to be placing the windows of a skyscraper one at a time, so this would be a good time to go through some of the corresponding Tinkercad Lessons if you haven't already. Download your finished .stl model and print!